Niko1300 is a truly “over-designed” amplifier performing in any musical and sonic conditions with an unprecedent dynamic, resolution and power management up to 1950W for the mono version and 1100W for the stereo version. 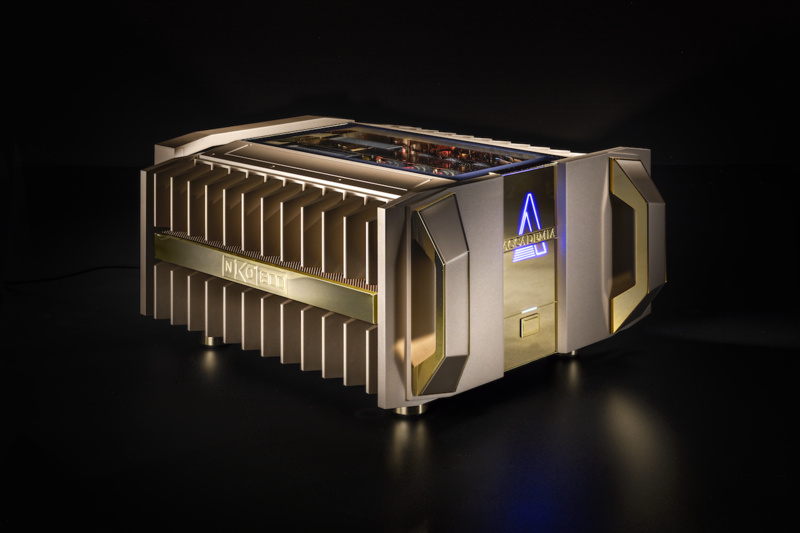 A unique high-end power amplifier capable to drive the most demanding and challenging loudspeakers on the market keeping a superb sonic performance. Its over-sized impressive mechanical chassis and heat sinks, machined from a 22 Kgs solid billet of 6060 aluminum alloy, allow a perfect thermal stability and cooling efficiency at all powers even under extreme use. Niko 1300 is using exclusively selected first grade components and completely hand-made under the supervision of the design team to guarantee uncompromised quality construction and unique details. The superb design brings the essence of the “Made in Italy” into an audio equipment to become a real piece of Technological Art in the high-end audio space. Finally! Something new is coming in the high-end audio scene to blend together style, power and unprecedent pristine sound. Not a new audio technology but a perfect implementation of the summit in design and luxury details, mechanical structure and audio technology. After a long experience in developing custom High-End audio equipment’s we at Accademia Lab believe that the essence of a power amplifier is to deliver music in a fully transparent way as it was originally recorded live or in the studio. This mean to assure the most linear and dynamic amplification process under any power level, conditions of use and kind of music. An amplifier that must be extremely powerful, fully transparent and with massive dynamic to provide to the listener the real feeling and emotion of what has been played as it would have done live in front of him and not introducing any possible alteration or peculiar “color” to the sound. At the same time, we wanted to make the amplifier a stylish element that will have its own life as a unique element to enrich with its presence any ambience. With this dream in mind we have designed NIKO 1300 to be an extremely generous and performing power amplifier with a unique high-end style and using a very “minimalist“ circuit approach to keep signal integrity at the highest possible levels. We over-dimensioned each element in the circuits chain and used the highest quality components and we at Accademia Lab implemented some unique mechanical and electro-mechanical solutions to guarantee the most linear and dynamic response at any power level. Completely hand-build in Italy it represents the essence of a very distinguishable Italian Style and of unsurpassed manufacturing custom quality. A real luxury piece of audio contemporary art. Niko 1300 is a dual monobloc class A/B power amplifier and come in 2 configurations as a Mono BTL amplifier with 1300Wrms at 8Ohm and 1950Wrms at 4Ohm or as a Stereo amplifier with 350Wrms at 8Ohm /670Wrms at 4Ohm/1100Wrms at 2Ohm. Both with a 10Hz – 90KHz band-pass @ -3db across all power levels. The two monobloc’s have each 16 matched power BJT transistor to guarantee the best efficiency in output current that can go generously over the 100Amps and the two blocks are then completely galvanically isolated and equipped with independed floating power supplies. All the components have been screened in terms of tolerance and thermal stability and they have been matched in term of electrical characteristics. For the transistor we have developed custom gold-plated thermal couplers to assure the best symmetry and stability of the power driving stages. To assure the lowest possible output impedance of the amplifier and the highest possible output current in all the possible heavy driving conditions, all the connections with the power transistors are made using gold plated 4mm solid copper busbars. This is a very crucial element when driving very demanding loudspeaker system to be able to maintain a flat response even with extremely high and sustained currents under any dynamic requests and the amplifier can manage a remarkable damping factor of more than 200 at 8Ohms. The dedicated analog power supplies use two separate custom design 1000VA toroidal transformers and the power supplies are housed on a floating mechanical platform equipped with servomotors. The platform can move down and disconnect physically the power supplies from the mechanical chassis and the power transistor monobloc’s to provide a complete isolation like you have with fully external power supplies to avoid any physical interference and undesired noise propagation. To assure the complete isolation even the power supply unit for the service circuits is completely independent from the audio line. Two capacitor filtering banks provide a massive 100.000µF running at 85V with the capability to store up to 300joule of energy to support even the most demanding dynamic situation with even the hardest loudspeakers like a band or orchestra is performing right in front on you. Even for the power supplies stage the electrical connections are made by gold plated 4mm solid copper busbars to insure a perfect and long-life electrical connections. High current power connection to the electrical grid is supported by a professional power connector “powerCON “ normally used only in high professional equipment and the only one capable to assure a perfect and robust electric power connection without compromises in terms of mechanical robustness and reliability. The 32A powerCON is an extremely robust and reliable locking single phase AC appliance cable connector for high current capacity (32 A rated). It is conceived as a non-standardized 3 pole connection system without breaking capacity to serve the needs of high power distribution systems and supplies for professional audio as well as demanding lighting equipment and installations. The connectors comprise of contacts for phase, neutral and protective earth (ground) conductors rated for currents up to 32 A and for voltages up to 250V. Input stage of the Niko1300 amplifier can be both “balanced type” (XLR differential input stage) to assure the lowest hum and noise from the input cables as well as “unbalanced type” . The two input modes are activated by a true by-pass switch selector. The pre-amplifier is designed to have the minimum number of components to avoid any unwanted additional “sound color” to the input signal and is housed in a sealed aluminum box for a total rejection to radiated noises and the input stage gain can be selected by a step switch and not a linear control to guarantee the same gain for both stages when using the stereo version. The Bias of the amplifier is managed automatically by the unit to compensate it at the change of temperature whilst the unit is continuously monitoring the output signal to provides the necessary correction to avoid distortions due to the non-linearity of the loudspeakers impedance. In this way and thanks to the over-sized power supplies and the extremely low output impedance, the unit eliminates the negative effects of the sudden impedance variation and the electromagnetics forces interactions generated naturally by the electromechanical loudspeakers and assure a linear response on all the frequency spectrum even when massive dynamic burst will happen. The amplifier is provided with DC-OUT, Over-Temp and Anti-Bump protection. An embedded Microprocessor monitors in real time the key parameters and manages the functions of all the internal elements including protections and the power supplies servomotors. All the external electrical connections are MIL based grade for long-life lasting and total electrical quality. The mechanical chassis is a unique element of the hand-crafted Niko1300 amplifier. It is the result of a spasmodic attention to details, quality and style and in really makes the NIKO1300 a piece of a kind in the High-End Audio panorama. Niko1300 is a 72Kgs mix of Italian style and Audio technology and the mechanical elements are one by one crafted from solid blocks of 20mm to 90mm thickness 6060 Aluminum Alloy using numerically controlled machines and been treated before painting with ceramic “ Micro Shot Peening” which yields a uniform opacity and eliminates reflections. Just the transistor block heatsink is a massive 9,5Kgs solid elements worked out form a solid 22Kgs aluminum block and can assure a total thermal stability and dissipation. Final surface treatment is done with Primer Universal High-Performance material with a shielding bottom and final Champagne or Carbon color paint. All these treatments assure a soft feeling surface with a total anti-fingerprint and anti-scratch for a long-life wear and shining rubbing resistance. Each Niko1300 unit is the result of a unique mix of unmatched Italian Style, pristine Audio Technology, maniacal Passion for Details and the long experience of a team with the dream to create the finest piece of Audio Art.